Our president is known as the community organizer in the family, but little if any attention is paid to the first lady’s relationship to a group in Chicago called Public Allies. At first glance it has a donor list that includes George Soros, the state of California, HUD, David Geffen, Fannie Mae, Sallie Mae, and the Woods Fund of Chicago. It appears to promote a New-Agey brand of community organizing that presents like a melodramatic Oprah taping. It is, however, considerably more complicated. In 1993, Michele Obama left Mayor Richard Daley’s administration to become the founding executive director of Public Allies — an offshoot of the Asset-Based Community Development (ABCD) Institute at Northwestern University — led by her old friends John McKnight and John “Jody” Kretzmann. McKnight and Kretzman had invented a way of leveraging assets by training community organizers to reframe negatives as positives and then to build congregation-centered coalitions. – There is no immaculate perception. – Language is a moral choice. – Affirmative stories can be utilized in order to stretch the collective imagination. – Learning the ABCD “language” is mandatory before you are allowed to practice it. The Need/Deficit Model: The park is a magnet for vandalism. The toilet block is consistently covered with graffiti. Local young people gather at the park on a Friday night and leave rubbish everywhere they go. The ABCD Model: The park is an important meeting place for local young people. They value the space available there to meet friends. Every afternoon and on the weekends, families with young children, people walking their dogs, and young people come to the park to picnic. The park is a central community asset for a range of groups and individuals. Barack Obama is also affiliated with Public Allies. Not only did he serve as a founding advisory board member, but John McKnight worked as an organizer with Barack and wrote his Harvard Law School recommendation. Both Kretzman and McKnight have been described by people who know the president as having had a huge intellectual influence on Barack’s thinking. Public Allies has received many media inquiries about our history with President-elect and Michelle Obama, and has been featured in many news stories about them. Following are some details and anecdotes about the Obamas’ history with Public Allies. President-elect Obama was a member of the founding advisory board of Public Allies. Michelle was the founding Executive Director of Public Allies Chicago from Spring, 1993 until Fall, 1996, and served on our national board of directors from 1997 until 2001. President-elect Obama was no longer on the board of Public Allies when Michelle was hired. Before joining Public Allies, she was an attorney at the law firm of Sidley & Austin and Deputy Director of Community Development for the City of Chicago. The Institute has a strategic alliance with Public Allies’ consulting group, The Leadership Practice, through which we provide training and consulting services on how to better identify and mobilize local community assets and participation to strengthen communities. The MSM promptly dropped the ball regarding what it is that Public Allies promotes or whether it might shed some light on how the Obamas view the world and remark upon it. In 1996, while Michele ran Public Allies, Barack won a state senate seat and the Welfare Reform Act ignited the progressives. Robert Putnam, a political science professor at the Harvard Kennedy School, convened a group of “the most interesting” pastors, politicians, pundits, artists, academics, and community organizers to meet every few months from 1997 to 2000. The Saguaro Seminar included an unknown Barack Obama, as well as George Stephanopoulos, E.J. Dionne Jr., Ralph Reed, John Dilulio, and Jim Wallis, the well-known progressive preacher who is now one of Obama’s “close spiritual advisers.” Also taking part was fellow Chicagoan Bliss Browne, a Public Allies teacher and the founder of Imagine Chicago. How are you pregnant right now, as an individual or as a part of a larger collective? What deep dreams are you carrying? Who is holding you as you carry these dreams? The Need/Deficit Model: The trip was a waste of time and taxpayer money. The Obama administration is rife with Chicago cronyism. Failure now permeates the White House. The ABCD Model: As much of a sacrifice as people say this is for me or Oprah or the president to come for these few days, so many of you in this room have been working for years to bring this bid home, and you have put together a phenomenal set of ideas that, no matter what the outcome is, we should be proud of as a city. Visit Michelle Obama’s home page at the White House. Read about Michelle Obama’s hopes for communities, about her work with Public Allies, and about her recognition of thework of John McKnight, Jody Kretzmann, and the Asset-Based Community Development Institute that helped define the principles and practices so critical to building her vision of healthy communities for the future. The Asset-Based Community Development Institute (ABCD) is co-directed by John L. McKnight, formerly the director of community studies at Northwestern University’s Institute for Policy Research, and his long-time collaborator in community research, John P. Kretzmann, a faculty member in the School of Education and Social Policy and IPR Faculty Associate. Marshall Ganz is one great social movement elder. He organized with Caser Chavez to build the United Farm Workers of America Union in the 1960s. He helped set the grassroots strategy that underpinned Obama’s 2008 presidential campaign. And Ganz has also spent the last decade or so teaching and writing about social movements at Harvard University. Ganz has a lot of useful information to share! His two websites (he’s got the Practicing Democracy Network one and then his Harvard University one) are chock-full of ideas, tools and resources for organizers. Some highlights include the detailed lecture notes of Marshall Ganz Organizing: People, Power, and Change course. This 100 page document contains the essence of 50 years of social movement campaigning. In this document, Ganz outlines his understanding of organizing, the art of learning to organize, campaigning, story telling, building leaders, and more. I enjoy Ganz’ anologies – comparing campaigning to snow falling on the ground, slowing building momentum, flake by flake. 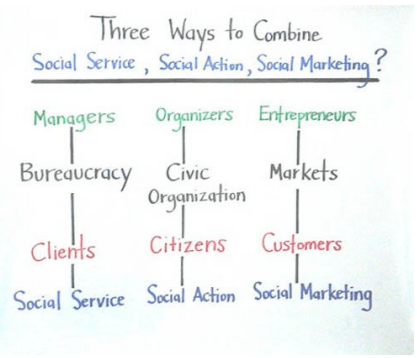 I also appreciate Ganz’ neat way of breaking down hard concepts, such as distinguishing organizing from other social change efforts, like social service and social marketing. I am often faced with this question when I’m talking to people who are new to activism. 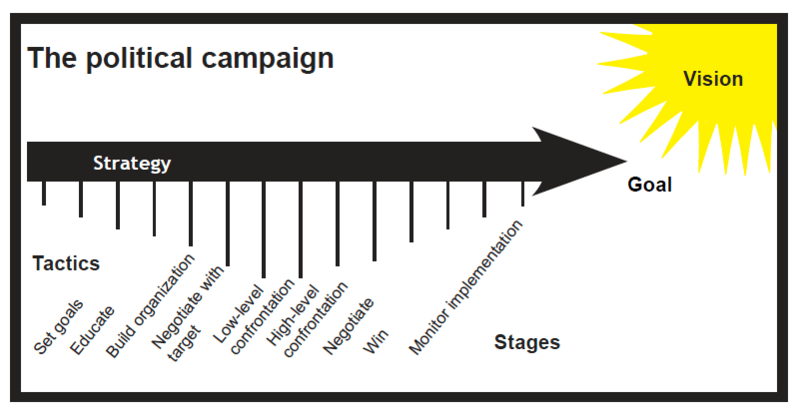 I also appreciate his diagram documenting the stages of a campaign. 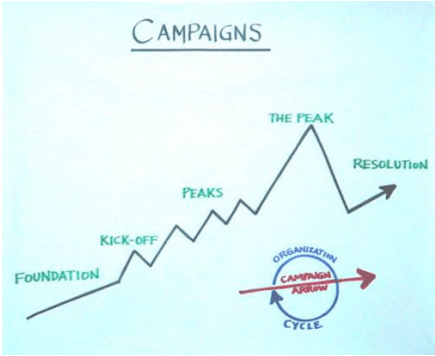 Ganz’ theory of a campaign complements the campaign diagram typically used by organizers with the Ruckus network. Ganz’s theory on narrative, which is being embraced by social movement groups across North America. Essentially, Ganz argues that organizers should a) encourage individuals to personally develop a story of why they have been called to action (a story of self), b) help a group develop a story of why we have been called (the story of us), and c) help the group collectively develop a story about the urgent challenge on which we are called to act (the story of now). Ganz uses Obama’s 2004 speech at the Democratic National Convention to expand his theory. To quote Ganz, “In Obama’s “story of self” he recounts three key choice points: his grandfather’s decision to send his son to America to study, his parent’s “improbable” decision to marry, and his parent’s decision to name him Barack, blessing, an expression of faith in a tolerant and generous America. Each choice communicates courage, hope, and caring. He tells us nothing of his resume, preferring to introduce himself by telling us where he came from, and who made him the person that he is, so that we might have an idea of where he is going. “Obama moves into his “story of us” when he declares, “My story is part of the American story”, and proceeds to lift of values of the American he shares with his listeners – the people in the room, the people watching on television, the people who will read about it the next day. And he begins by going back to the beginning, to choices made by the founders to begin this nation, a beginning that he locates in the Declaration of Independence, a repository of the value of equality, in particular. He then cites a series of moments that evoke values shared by his audience. Is Obama Practicing Stealth Taqiyya American Style? Are Progressives Abetting Obama’s Ruse? Obama the Story Teller; Marshall Ganz Style. Did Obama make the movement; or did the movement make Obama?